Wilderness hunting, the raw kiwi experience, this is not just a hunt it’s an expedition. Wilderness hunting in New Zealand is as ‘kiwi’ as it gets and very similar to the way most local kiwi hunters hunt. The New Zealand wilderness is a place of unrivalled beauty and grandeur. Crystal clear rivers flow through bush clad valleys which rise up to exposed rock faces and snow covered tops. 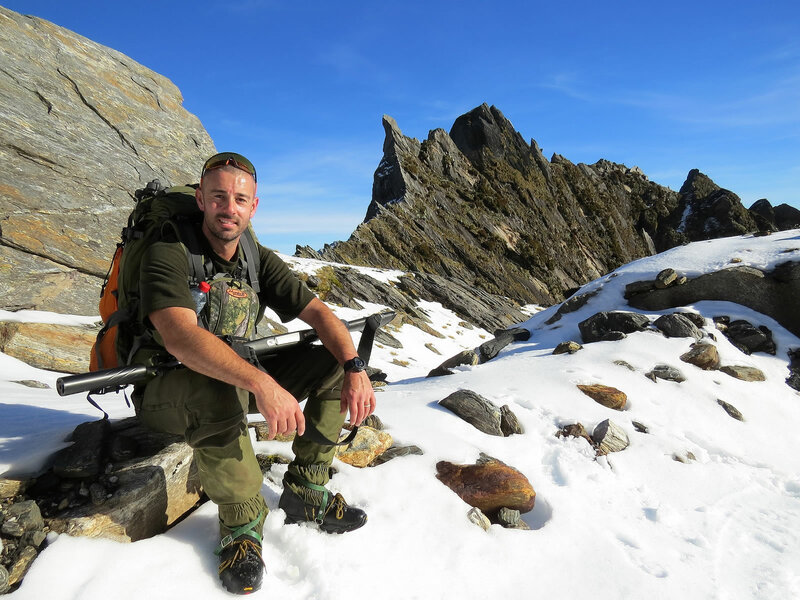 Tahr and chamois do live in moderate numbers in the New Zealand wilderness (public land) with good trophy quality. Tahr and chamois are found in close proximity to each other, a combination hunt is our most popular wilderness hunting option. We fly in by helicopter with our provisions and set up a basic spike camp. The flight in is an awesome and spectacular way to begin your wilderness hunting safari as we track through the different valleys and high mountain passes of the Southern Alps. You may even get your first glimpse of an animal. On our wilderness safaris there are no roads, tracks or any signs of civilisation, just pure unspoilt New Zealand wilderness. Generally the helicopter will land us right at our campsite. We hunt from a basic tent camp; tents are alpine quality, with air mattresses and warm sleeping bags. A cooking and sitting area is erected by means of a tarpaulin or fly. In some areas it is possible to light a fire for warmth; alternatively a gas heater is provided. Usually we can spot animals from the campsite. Wilderness hunting safari camps are as comfortable as possible with the helicopter weight restrictions we have. This is the most challenging form of hunting we offer. As far as the hunt and experience goes this is the pinnacle, a true test of the hunter in the wilderness amongst the elements. Animal numbers are moderate to good in most areas. Generally we are not affected by other wilderness hunting parties, but this is a possibility as no one in New Zealand has an exclusive hunting concession over public land. Terrain is steep and mountainous. We are generally hunting the alpine scrub edge and the open mountain tops, although depending on the time of year we may be camped lower down hunting a main valley. There are animal pads or tracks to help us get around, but footing is often uneven and there are not too many areas where we can just stroll along, often climbing on all fours is needed. Wilderness hunting safaris are available for the free-range hunter who wants a true kiwi hunting experience. Sometimes weather conditions and big country make for tough hunting; when you do take an animal you have really earned your trophy.